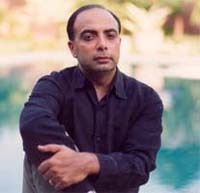 Tarun Tahiliani is the founder of the Tarun Tahiliani Design Studio. He is one of the leading fashion designers in India. His eponymous brand is synonymous with high style and impeccable sensibility. The design studio is based in New Delhi. The garments produced are sold in New York, London, Tokyo, Honk Kong, Dubai and in his own stores in New Delhi and Bombay, India. Tarun is probably India’s most established designer in India in terms of infrastructure and distribution. His talent has enabled him to transform traditional Indian drapes, textiles and techniques into modern technically innovative structured forms that translate into an international contemporary look. Style, craftsmanship, quality and refinement are the defining symbols of Tarun’s garments. The Design Studio produces bridal trousseaus, exclusive evening wear for discerning women and men’s line. He has also recently launched a prêt line. Tarun Tahiliani has a degree in management from the Wharton School of Business and associate degree from The Fashion Institute of Technology, New York.